My interest in early Alaska aviation, made me buy a book about Merle K. 'Mudhole' Smith. This book enabled me to digest some info on an early Alaskan airline: Cordova Air Services, later renamed Cordova Airlines (1934 - 1968). In 1939 Mudhole Smith accepted the position of President & General Mngr of Cordava, after the death of “Kirk” Kirkpatrick in a crash (10Apr39). 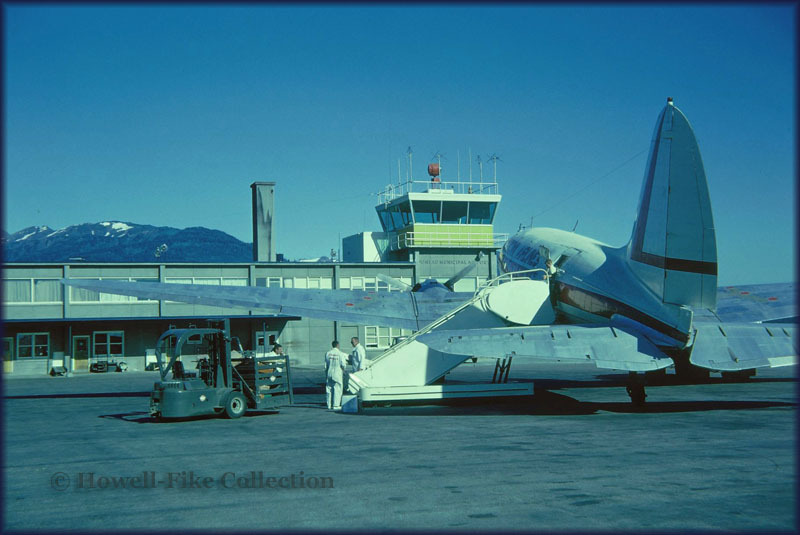 Kirk had founded Cordova Air Service in 1934 with some local businessmen (of which many had connections with the Copper River & Nortwestern Railway – which ran from Cordova to the Kennecott copper mines). Merle K. “Mudhole” Smith had been flying for Kirk. Except the air transport, Cordova A/S also ran an aircraft repair shop at Eyak Lake airstrip. Cordova Air Service started a subsidiary –at some point- at McCarthy: Copper Belt Line; the planes featured a large copper belt painted around the fuselage. In the Fall of 1938 the mines closed, having considerable negative effect on business. In 1939 a Travel Air 6000 joined the fleet (earlier types included Bellanca –which arrived in Alaska by steamship- and Stearman, numbers of aircraft unspecified). During 1939 Cordova Air Services developed services to Chitina and McCarthy and increased frequency to Anchorage; Wrangell, Juneau and Petrersburg were also among the destinations. Fishing trips in the area, such as to Tebay Lakes, were promoted too. In 1939 the newly appointed Civil Aeronautics Board (CAB, not long hereafter renamed Federal Aeronautics Administration -FAA) came to Alaska to hold hearings and make recommendations that would have a profound effect on flying in Alaska (as well as in the rest of the USA). I was mighty pleased that John Cooney, after many years since I started this page, has gone through the trouble of sending me a photo for this endeavour (august 2016). John wrote (august 2016): "My mother as seen in the photo was a flight attendant for Cordova." 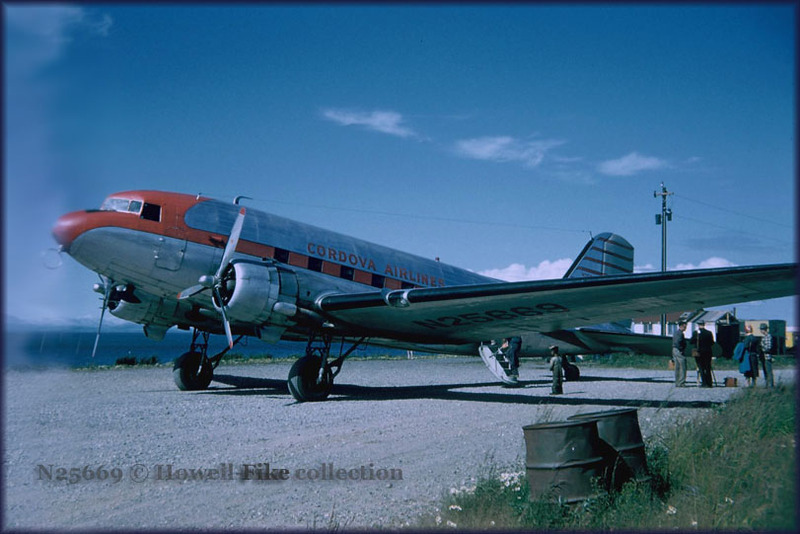 Perhaps this photo was taken at the airport of Cordova (now named Merle K. 'Mudhole' Smith Airport, in honour of a pilot who in 1939 became president of Cordova Airlines and which used the airport as a hub between 1934 and 1968), but seeing the gravel and crew perhaps waiting for passengers to board, this may well be somewhere more remote in Alaska, part of the network of Cordova Airlines at the time. During 1941 the Morrison-Knudson Company had contracts to build a series of airfields and FAA stations in Alaska. Cordova AS did brisk business with them. Smitty was the 1st to land on the new Eielson AFB field in Fairbanks. Harold Gillam, another famous name in Alaska’s pioneering aviation history, became chief pilot for the Morrison-Knudson Company. Gillam also ran his own Gillam Airways. He made Mudhole a job offer and it seems he accepted in some form or capacity (earnings going to Cordova A/S?) as he did their Boeing 80-A planes (at that time they had 2). ; he also flew the big Pilgrim for them in 1942, on the Kuskokwim Mail Run (visiting a dozen or more small communities on the river). In 1943 the CAB denied a merger between Cordoba A/S and Alaska Star Airlines. In 1944 the stockholders asked Smitty to return as the company was in bad shape: the management had moved to Anchorage, the fleet was down to only 1 plane, a Bellanca (and only 1 pilot!) and local bush services were neglected. By this time Smitty had little left to do with Morrison-Knudson, operations were winding down. Mudhole Smith returned to the airline in Jul44 and decided to buy out all stockholders. He also bought an SM8A Stinson from Jack Peck in Anchorage; with these 2 planes he began to rebuild the bush service that had languished during the height of the war. Later Smity added a couple of SR10 Stinsons and from Bristol Bay Air Service he acquired an SR9 Gull-Wing Stinson (capable of carrying 4 passengers!). I also came across the name Jack Peck in research of history of some Beech 18 of Alaska Aeronautical Industries; who was he? "I was checking out your website, and it was interesting to have you ask who Jack Peck was, because I actually know who the guy was... He was my Grandfather! I think a great many of the old time Bush Pilots new him well. I don't have all the details, but I can fill in a couple of them for you. My Grandfather began by starting an airline called Peck & Rice Airlines in the 1930s, which I believe flew mail, passengers, and cargo in and around the Bethel area. After this he flew for a time for Alaska Airlines, and then started Alaska Aeronautical (AAI), at the same time operating a Cessna dealership out of Lake Hood. This lasted up until the early 1970s when he sold AAI, and the airline began to get its reputation as a less then safety conscious airline, which upset him to no end. He then became the Airport Manager for Anchorage International Airport for several years before taking the position of the Director of Aviation for the State of Alaska. My Grandfather is also an OX-5 Hall of Fame recipient, something he was very proud of. He retired from his position as Director of Aviation (Alaska) in the mid-1970s to the Kenai Peninsula, and passed away in the late 1970s from cancer. I was a young teen when he passed away, but I racked up many miles with him flying around Alaska, and the man could fly! Nobody I've ever flown with since has been able to grease a landing in like this gentleman, and yes, that even included some very nasty weather." "Howdy. My name is Lynn Burlingame and I spent the summer of 1965 as a lineboy for AAI on Lake Hood. Here are some specifics about the operation. AAI had a contract with Standard Oil Co. on Cook Inlet and hauled freight and passengers to their locations. They had two straight tail Cessna 310's and two Beechcraft D-18s. One of the D-18's was set up for passengers, and the other one was set up for freight with a cargo door. AAI was a family operation. Jack Peck ran the show. His wife (I show her as 'Mrs. Peck'. I think her name was Jackie.) was the secretary and bookkeeper, his son Brian was in sales and ground school, his other son Jack, Jr. was a mechanic. His wife's brother, Jack Archer was head mechanic. Jack Hamlin was a mechanic. He had a wooden leg. Seems like he lost his leg in a motorcycle accident. Anchorage, so he may still be alive). It was a tight operation. Peck (as everybody called him) was a good guy to work for, but very stern. His wife pretty much ran the show. Mechanical work was done precisely and with a great deal of attention to detail. I was there from June 1965 until later November. I mowed the taxiways, helped the mechanics, cleaned the student pilot puke out of the 150, did the janitorial work and anything else that needed being done. I made $1.50 per hour. Several times Pierre took me out on flights so I could help unload the aircraft. Peck had a policy of cancelling all debt if a pilot was killed in an accident. Over the years this cost him a lot of money. I recall a major cleanup effort that summer. We had stacks of aircraft wings behind the hangar and we hauled them to the dump after crushing the spars with a sledgehammer. Peck required this for fear that somebody would try to salvage the wings and put them to use. All were badly damaged and were not serviceable. In particular, I remember one wing that was stuck together with duct tape. It was badly crushed and somebody had shoved the inside full of branches to form an airfoil. Peck told me that a pilot crashed his plane, but managed to fly it out with the impromptu repair. Don Sheldon was a frequent visitor. He would fly in from Talkeetna, park his plane and borrow a car to go shopping, do business, etc. One time flew a Super Cub in that had eight 12 gauge shotguns mounted on the wing struts! This was his wolf hunting rig. The shotguns were welded to brackets in pairs and clamped to the struts. He had drilled the trigger guards and installed electrical solenoids that would pull the triggers. A mess of wiring led to a switch box in the cockpit and he had a pushbutton on the stick to fire the guns. The switches were set up so he could fire any pair of guns or any combination of pairs. The outfit was completed with a piece of plastic with crosshairs taped to the windshield for a sight. He told me that the first time he fired the guns he was slow flying with the flaps down, and the recoil of all eight guns nearly caused him to stall..."
The network saw scheduled services between Cordova and Anchorage, 4 times weekly and once a week he flew Cordova-Fairbanks (stopping at Valdez, Copper Center, Gulkana, Gakona and Paxson). Next fleet acquisition (1945) was a Lockheed L-10E Electra, which he bought from Morrison-Knudson for usd 25.000,- It was the 1st all-weather, twin-engine airplane between Anchorage and Cordova. The Electra was kept for a year, sold in Seattle, and a DC-3 was bought - which came in handy during a major shipping strike; after the strike was over the DC-3 proved to be too big and was sold. In 1950 Mudhole Smith was found to be suffering from diabetes and as a result his flying days were over. The company expanded and in 1951 saw 10 aircraft in operation of which 3 were twin-engined. In 1952 Cordova A/S merged with Christansen Flying Service (led by pioneer bush pilot Haakon Christiansen). A visit to California’s Knotts Berry Farm inspired Mudhole to open a lodge in McCarthy and fly tourists there. In Dec.1952 both Valdez and Seward were improved to handle DC-3s and Smitty purchased a DC-3 again. Both in 1952 and 1953 Cordova Air Services won the Aviation Safety Award; the name of the airline was changed to Cordova Airlines. In 1953 the new Anchorage IAP opened and operations moved from Merrill Field to the new airport. When the Kennecott mine closed, Cordova Airlines developped it as a tourist destination during the summer. The McCarthy-Kennecott tours proved to be a success over a period of 5 years, but at some point in 1964 or 1965 it was made impossible to continue. This made Merle Smith look for other possibilities and a new destination was found in Canada’s Dawson City in Yukon Territory. Flights started on 21Jun65 and proved to be a big success, thanks to good local cooperation as well as US and Canada governmental departments. A Curtiss C-46 was used for these flights as well (N7779B suffered substantial damage upon landing at Anchorage 05Sep63, see NTSB report ANC64A0012). On 27Mar64 a severe earthquake shook southcentral Alaska for 4.5 minutes and a huge tidal wave rampaged along the coast. But Cordova came out relatively unharmed. When in Aug64 Smith obtained the traffic rights to operate to Juneau, he introduced 2 Convairs to the fleet. In 1968 Cordova Airlines merged with Alaska Airlines. Cordova Airlines also operated an Aero Commander as can be learned from this page, which reports an accident at Skilak Lake,AK 09Apr56. Roger Galliett wrote me (Feb.2007): "My dad was the sole survivor of the crash-landing into Tustumena Lake in 1965. They recovered the Grand Commander off the bottom of the lake and flew it back to Anchorage where it sat for many years. I remember him driving us past it and telling us 'That's the plane!' many times. I wonder who ended up with it..."
"Starting in 1925, the Alaska Territorial Legislature authorized the use of Territorial Road Funds, which were managed by the Alaska Road Commission, for the construction of airfields. The same year, the Alaska Road Commission adopted a standard size for airfields, 1,400 by 600 feet. Over the next six years, they constructed over 70 airfields, including fields at both Valdez and Cordova. In 1934, an airfield at Eyak Lake was constructed with Public Administration Funds. The Thompson Pass Airfield was built in 1936.Better airfields led to the establishment of commercial companies in Cordova and Valdez. Kirk Kirkpatrick started Cordova Air Service in 1935. In 1939, Merle "Mudhole" Smith purchased Cordova Air Service which later became Cordova Airlines. Smith's name "Mudhole" commemorates one of his more memorable unsuccessful takeoffs. Early on, Smith's air service served both the Sound and the Copper River settlements. Later Cordova Airlines offered service to Anchorage, Valdez and the communities of southeast Alaska. Bush pilots from Cordova made bush deliveries to the canneries and mining communities throughout Prince William Sound. Cordova's Eyak Lake made a perfect fresh water seaplane base in the summer and during the winter, when frozen, was perfect for skis." "The years between the World Wars saw a dramatic rise in tourism during the 20s, a sharp decline during the depression, and a vigorous recovery leading up to World War II. Several World War I trends continued: a shift in mode of travel from horseback or sledge to automobile, railway, and plane; a growing popularity in "package" tours; a continuing interest in the area by out-of-state owned tourism companies; a rise in more locally owned tourism businesses; and an increase in tourism promotional efforts sponsored by local newspapers, organizations and businesses. In April 1938, the tourism industry received a shock. E.T. Stannard, president of the Kennecott Copper Corporation, announced the October closing of the Kennecott Copper Mines. Closing of the CR&NW Railway had a major effect on tourism in both Cordova and Valdez as well as for the roadhouses and towns along the popular Cordova-Chitina-Valdez circle route." Alaska Airlines traces its roots to the hardy pilots who flew the Alaskan "bush" in the 1930s. The airline was assembled through a series of purchases and mergers leading to the creation of Alaska Star Airlines in 1942, which dropped its middle name one year later. Alaska Airlines won federal approval for its first scheduled route linking Portland, Seattle, Fairbanks & Juneau in 1951. From the Bush to Berlin, Alaska Airlines grew out of a single-plane company established by Linious McGee in 1932. McGee Airlines merged with Star Air Service in 1934. Under the leadership of Raymond W. Marshall, the airline aggressively pursued further purchases to create Alaska Star Airlines in 1942. The middle name was formally dropped on May 2, 1944, narrowly beating out a competitor who had also applied for the name Alaska Airlines. Following the end of World War II, Alaska Airlines acquired a fleet of surplus military aircraft, including DC-3, DC-4, and C-46 transports. In addition to providing charter passenger and cargo services in the Pacific Northwest, these planes participated in the 1948 Berlin Airlift (ferrying supplies to the city's "free" Allied zones after Soviet forces sealed the East German border), evacuating Chinese Nationalists during the last stages of the 1949 Communist revolution, and carrying Jews from around the world to the new State of Israel. It introduced its first jetliners in the 1960s and grew to become a major regional airline. during Dec.2001 they claimed to own it, reported as 'hulk @ Sachs Harbor,Banks Island,NWT (Beaufort Sea)'. Fairbanks,AK for use of spares'. Ln Jun08 @FAI Everts' off-airport dumpsite, traces of Cordova Airlines titles'. 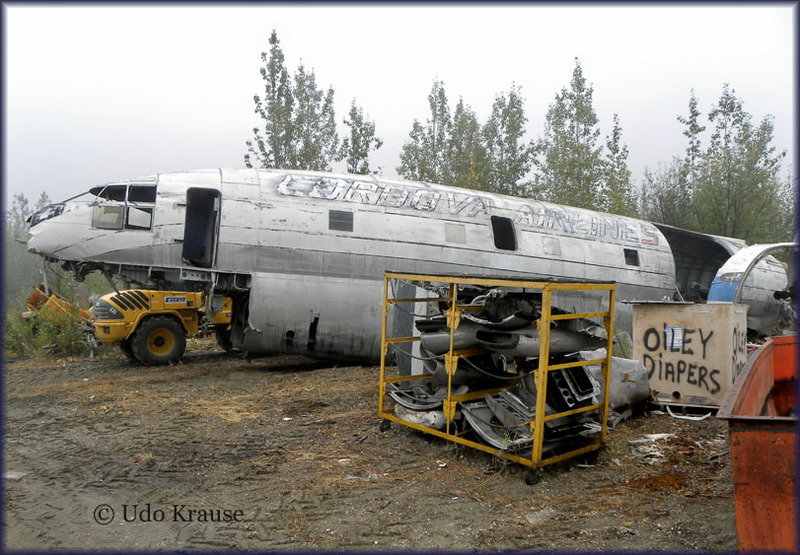 "After our Cordova Centennial Aviation History weekend, I wrote an articla that appeared in both the Wrangell St. Elias News and the weekly Cordova Times. Ken Smith wrote an article on the first DC-3 crash on the new McCarthy runway in 1965, which appeared in WSEN's March/April 2008 issue. My article appeared in WSEN's September/October 2008 issue. The Cordova Times printed it with more photos, and it can be accessed in their archives at www.thecordovatimes.com/news/show/3184 and an article on Cordova's aviation history at www.thecordovatimes.com/news/show/3148. "Wrangell St. Elias News can be found at wsen.net It was an incredible weekend, and felt like Troy and I were holding our own "Airline Management 101" tutorial... Glad that's over, but now he's talking about a trip to Dawson City! 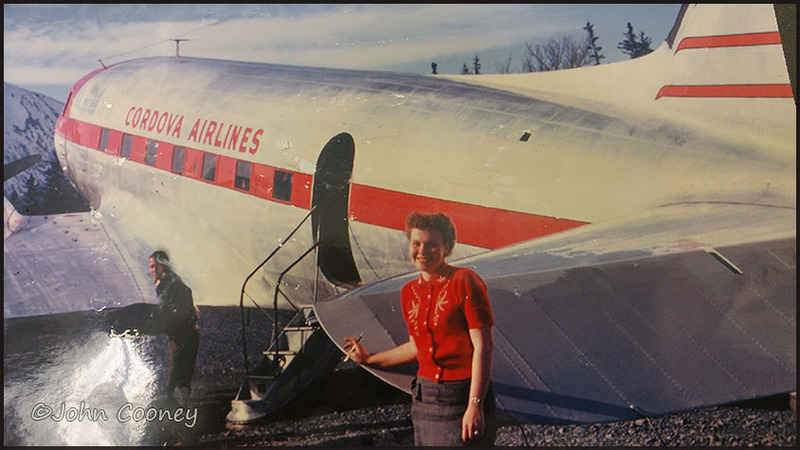 Thanks again for providing this information on Cordova Airlines,"
Bill Fike's daughter, Tricia Howell, asked me to go ahead and share some photos with aviation-minded people, so here are a couple of scans from her father's slide collection." DC-3-314A N25669 (c/n 2242) flew with Braniff before its career with Cordova Airlines. After that it flew with Alaska Coastal Airlines, Ellis Airlines, Alaska Marine Foods and it ended up with TALA Colombia as HK-2819X and its fate there becomes obscure, perhaps resting in the jungle somewhere in Latin America..
N66785 (C-78/UC-78 c/n 3875, ex USAAF 42-58384). Later s/t Northern Consolidated Airlines, date unknown it was wfu by 1-8-52 due to separation of wood in spars and possible rot. Used to test floor structure for cargo load limit increase for rest of NCA fleet. N30023 (AT-17B/UC-78B c/n 4629, ex USAAF 42-71933). S/t Northern Consolidated Airlines 5-4-52. Recovered from dump, Nome, AK, 1988. S/t Alaska Aviation Heritage Museum, Anchorage, AK, 18-1-90. Preserved. N61832 (UC-78B, c/n 6194, ex USAAF 43-32256). DMfr 20-8-43. Spent entire military career with the 3027th Base Unit, Western Flying Training Command, Pecos AAF, TX. Went to War Assets Administration for disposal at Cuero, TX, postwar (exact d. unk. at this point). S/t Northern Consolidated Airlines Inc., Anchorage, AK, 5-4-52. Reported sold,16-3-70 (buyer not named). Reg’n. canc’d. 25-6-76. Fate unknown. Ownership by Cordova is confirmed by a mortgage with First Bank of Cordova dated 20 December 1951. All three were mortgaged that date for a total of $7,500.00 ($2,500.00 each). N30023 and N61382 had the Lycoming engine conversion (Lycoming R-680E replacing Jacobs L-4B)." "I worked for Cordova from 1960 to 1962. I was just out of high school and worked for Ralph Givens in Cargo. Actually I was the Anchorage gopher and did everything from loading cargo and bags to parking airplanes and running down parts. We had a couple of DC3/C47s, C46s, a couple of Widgeons and a number of aircraft on floats. My first task, when I was hired, was to load a DC3 with Drilling Mud. I had to put my hands in very hot water to get them to work. The next morning, before I left for the USAF ahead of the draft, I could pick up a 55 gallon drum full of fuel oil. I was also an expert with a Johnson Bar."